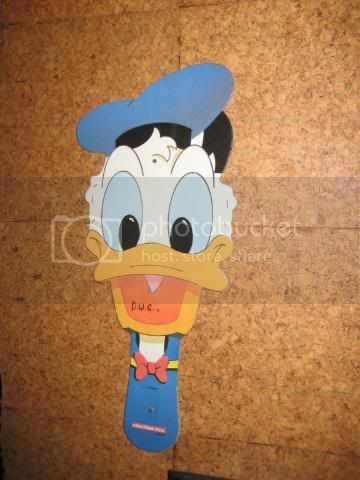 That photo up there is my Donald D.U.C.K. paddle. At least it used to be mine. I bet you are wondering why it is nailed to somebody’s basement dungeon wall. About six or seven years ago, I was invited to a D.U.C. party. D.U.C. is an acronym for Dyke Uniform Club. They are extremely emphatic that D.U.C. is always spelled out and that they are not to be called “Ducks.” They hate that. So this party that I was invited to was a uniform party. I realized way back that, while I appreciate a uniform on someone else, it isn’t really my thing, I am a six-year-old princess. Luckily, that lends itself to wearing a little girl sailor dress, so I had the perfect outfit for the party. Since it was a play party, I needed to bring a toy or two. My Donald Duck paddle would be perfect. because Donald wears sailor clothes too. But it was important for me to be respectful to the D.U.C., so I renamed it my Donald D.U.C.K. paddle. It was only proper. I arrived at the party and everybody was surprised at my uniform dress. They were not quite sure how to wrap their heads around it. As perfect as I thought it was, they thought it was just not right, but they were gracious and did not say anything about it. It was not until I brought out my Donald D.U.C.K. paddle that they really lost it. “What’s that! ?” barked the General. The four Generals were totally nonplussed. They quickly conferred and decided to take a meeting in one of the back rooms. I stayed in the social area and hung out talking to people. After a little while, the Generals returned to the front. I saw them speak to one of their recruits and point my way. The recruit came over to me and asked me to hand over the paddle. When I refused, the little pipsqueak tried to wrestle it from me. Pffft! That wasn’t happening. It was easy for me to defend my paddle from that little recruit. Then the Generals sent another bigger one my way. I may be a girl but I know how to stand up for myself so I also deflected that one. Finally, the Generals, sent three at once. I was sorely outnumbered and sadly I lost my beloved Donald D.U.C.K. paddle. It now resides, with a nail between his eyes, in a pace of honor in the General’s dungeon. Hanging with a nail between the eyes! Like as if it were a trophy or something.